GE this morning released an announcement regarding new wind turbine technology that can make win turbines more powerful and more profitable. GE this morning released an announcement regarding new wind turbine technology that can boost wind turbine output by up to 5%, which equals a whopping 20% or so more profit per wind turbine. PowerUp is the new “Industrial Internet” technology that makes this considerable output improvement possible. It is a customized software-enabled platform available for all of GE’s wind turbine models. This announcement was actually one of 14 new industrial internet predictivity technologies launched by GE today, following up on the first 10 that it launched last year. As Chris Varrone wrote back in 2011, “GE wants to sell you everything.” In terms of revenue, GE is the 25th-largest company in the world. In the energy industry, it is involved in the use of nearly every type of energy resource, and some of the predictivity technologies announced today were for oil, some were for natural gas, and some were for wind power. Beyond energy, the technologies are for aviation, healthcare, and more. In the end, the goal for all of them is better efficiency and better economics. “To put things in perspective, today our customers have more than 9,000 GE 1.5-77 turbines running in the United States. Even a 1 percent energy output increase on this installed base would generate more than 420,000 megawatt hours of additional energy each year, which would provide the equivalent power used by 33,000 average U.S. homes.” That’s just 1%! 5% would mean enough power for an additional 165,000 average homes, simply thanks to the output boost provided by this Industrial Internet technology. Following the lego-like GIF below, I’ll share more information on what exactly PowerUp does. 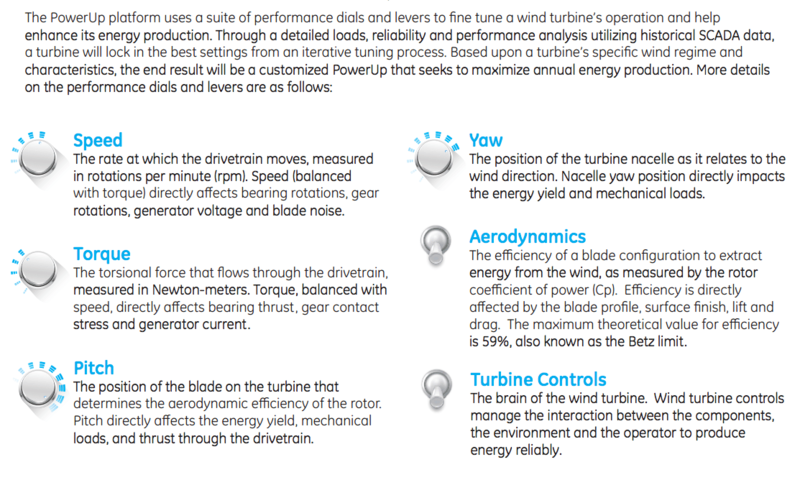 PowerUp adjusts, in real-time performance, wind turbine factors such as speed, torque, pitch, aerodynamics, and turbine controls. 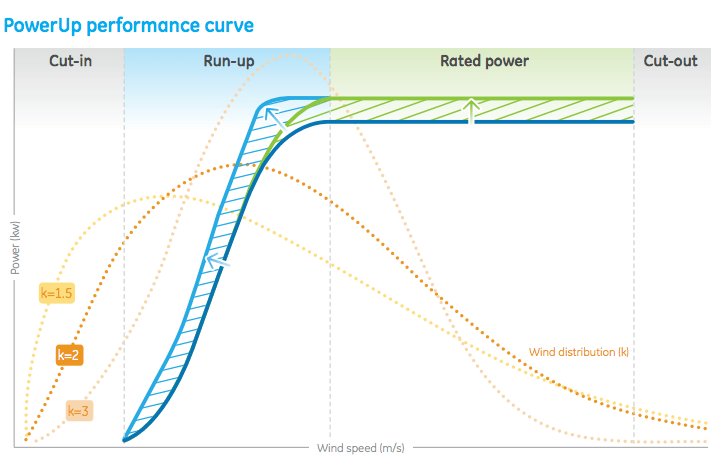 The GE software program also “performs a complete before-and-after wind farm power performance analysis, validating the performance improvement,” GE adds. And that’s a critical component of it all — analyzing the results (quickly), and using the data to improve technologies or business processes. If there is one single message being presented today, it is the tremendous investment GE and partners are putting into developing an Industrial Internet that will transform not only future technologies but also every aspect of the businesses that use those technologies.